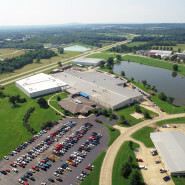 Missouri’s Parkland features several industrial parks and sites to meet your property requirements. The Farmington Industrial Park includes over 200 acres of available property with local incentives including reduced land price based on employment, assistance with utility and street extensions, and other benefits. The Farmington IDA Board of Directors can also provide support in acquiring financing for your project. All property within the Industrial Parks is owned by either the City of Farmington or the Farmington IDA. The Farmington IDA will provide assistance in evaluating and acquiring other property sites for your company’s needs, if currently available property is not adequate for your growth plans.